by Various Author · Gavin Alexander Author of introduction, etc. Out of the intellectual ferment of the English Renaissance came a number of outstanding critical works that sought to define and defend the role of literature in society and to comment on the craft of writing. 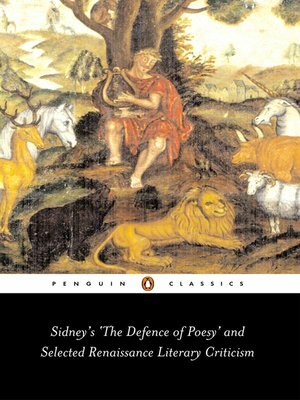 Foremost among these is Sir Philip Sidney's "The Defence of Poesy," an eloquent argument for fiction as a means of inspiring its readers to virtuous action. George Puttenham's "The Art of English Poesy" is an entertaining examination of poetry, verse form, and rhetoric, while Samuel Daniel's "A Defence of Rhyme" considers the practice of versification and praises the English literary tradition. Along with pieces by such writers as Sir John Harrington, Francis Bacon, and Ben Jonson, these works reveal the emergence of key critical ideas and approaches, and celebrate the possibilities of the English language.